Tip Top Builders is your go-to company in the Los Angeles area for room additions or other house add-ons. If you are experiencing a lack of space in your home due to the arrival of a new family member, a relative moving in, or you just want another bathroom, a room addition is a great solution. Cost-wise, a room addition is much cheaper than purchasing a newer, bigger house. Tip Top offers a free in-home estimate for room additions. They will send an actual contractor to your house, free of charge, and give you an accurate estimate. Their contractors have been in the business for many years, and know exactly what to factor in when giving an estimate. They are aware of all charges that may incur throughout the process. Tip Top handles the renovation from inception to completion. They will help you plan the entire addition, from design to electrical to plumbing, and then follow through with the construction on time and on budget. Tip Top offers premium quality craftsmanship that you won’t find anywhere else. Their contractors will submit all necessary plans for construction, and make sure everything is approved before building begins. This entry is filed under Room Additions and tagged about us. 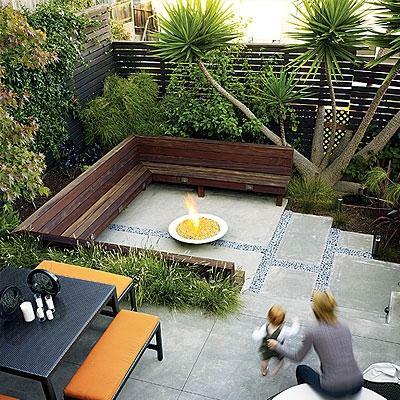 As we all know outdoor living space is precious, especially in urban settings. When the amount of space you have is an issue, but the need to enjoy the outdoors is paramount, you must work with what you have to achieve maximum results. Getting creative with your yard will help you utilize the most of your space and create that outdoor living area where you and your friends and family can enjoy for years to come. Here are some ways to make that small space appear large and inviting. Making the most of your yard means using every available inch. Now this does not necessarily mean making the entire yard usable, but by having a creative combination of living and viewing space your yard will seem larger. Use stonework, decks, and pathways to create clearly defined space. 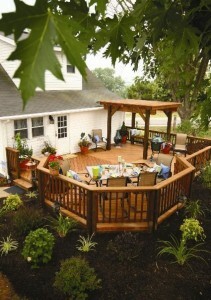 Separation also creates the illusion of more space and will add to the overall aesthetic appeal of the yard. Using vertical lines and accents creates the illusion of space. It also allows you to have potted plants where normally you wouldn’t be able to. Just be careful when watering them, as wet soil can stain siding. Plant small shrubs, or trim trees so they complement the space, not consume it. Accent walls help divide the space as well as provide a side table or potting bed. 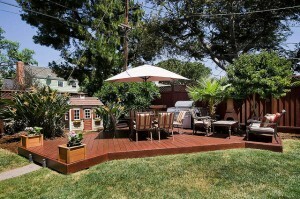 Perhaps the best way to make your small yard seem bigger is to utilize perspective. Constructing a pathway either down the middle of your at an angle, or straight with a vine-covered pergola will create a vanishing point that will make your yard seem to go on forever! This entry is filed under Exterior Hardscaping and tagged decks and patios. The most basic and common type of deck is the attached deck. 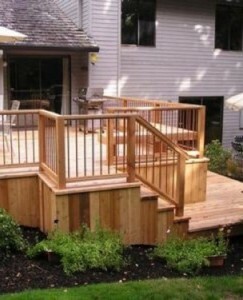 An attached deck is much like a patio, except it is wooden and slightly raised. Often times it will serve as not only an enjoyable outdoor living space, but as a pathway connecting exterior doors of an L-shaped house. The advantage of a detached deck is that it can be positioned anywhere on the property and take advantage of a sizable yard. 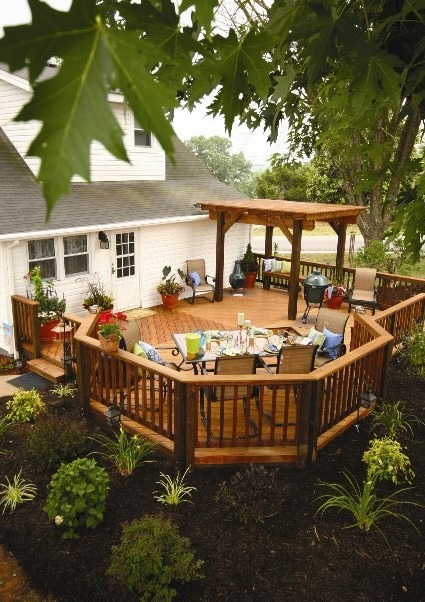 This type of deck allows you to have some privacy and seclusion when creating your outdoor space, and can work well with the exiting topography of your yard. If your property has a sloping elevation, a multi-level deck may be your answer. It can lead gradually down to a grassy or wooded area, putting you right in the middle of the outdoors for maximum enjoyment. An often overlooked part of the yard, the side-yard is prone to disarray and neglect. 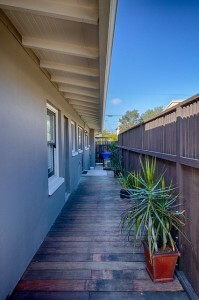 Especially in urban settings, it’s important to use every part of your home and yard to maximize living space. Your side-yard can be a nice private off-shoot from a side bedroom or a cozy eating area next to the kitchen. Don’t neglect this space, make it useful instead, you’re paying for it! This entry is filed under Exterior Hardscaping and tagged deck ideas. As the economy continues to be slow to recover, many people will find themselves living in situations they are not used to in order to save money. One instance of this is multi-generational housing, or more than 2 generations of one family living under the same roof. Although it doesn’t always necessarily need to be more generations; it could be brothers, sisters, aunts, uncles, or cousins living together. There are many reasons for consolidating your family under one roof. For parents, you could be returning to school, saving money for a house, or just need to get out of debt. Maybe you just want to live in a nicer, safer neighborhood and partnering up with a set of grandparents or brother/sister is your ticket out. There could have been an extenuating circumstance like a bankruptcy, loss of job, divorce, debilitating injury, disease, or death in the family. So you are all living together, now what? Getting along is crucial, especially since this is your home. In order to make the best out of your situation, it’s time to define the living space. Make sure boundaries are clearly defined. Discuss the circumstances as a group; get everyone on the same page. Be clear about finances: Who will be paying for what and when? The clearer you are up front, the better things will be in the long run and you will be better equipped to handle situations as they arise. Good luck and happy saving! If you need to add more space to your home, the professionals at Tip Top Remodeling specialize in room additions. This entry is filed under Room Additions and tagged financing.